All banners were released and modified under a Creative Commons Attribution 4.0 International License (CC BY 4.0). Audouard, E et. al. (2012). The Onecut Transcription Factor HNF-6 Regulates in Motor Neurons the Formation of the Neuromuscular Junctions. PLOS ONE 7(12): e50509. doi: 10.1371/journal.pone.0050509. Forsberg, K et. al. (2010). Novel Antibodies Reveal Inclusions Containing Non-Native SOD1 in Sporadic ALS Patients. PLOS ONE 5(7): e11552. doi: 10.1371/journal.pone.0011552. Luo, C et. al. (2012). Patterns of Spontaneous Brain Activity in Amyotrophic Lateral Sclerosis: A Resting-State fMRI Study. PLOS ONE 7(9): e45470. doi: 10.1371/journal.pone.0045470. Niikura, T et. al. (2014). 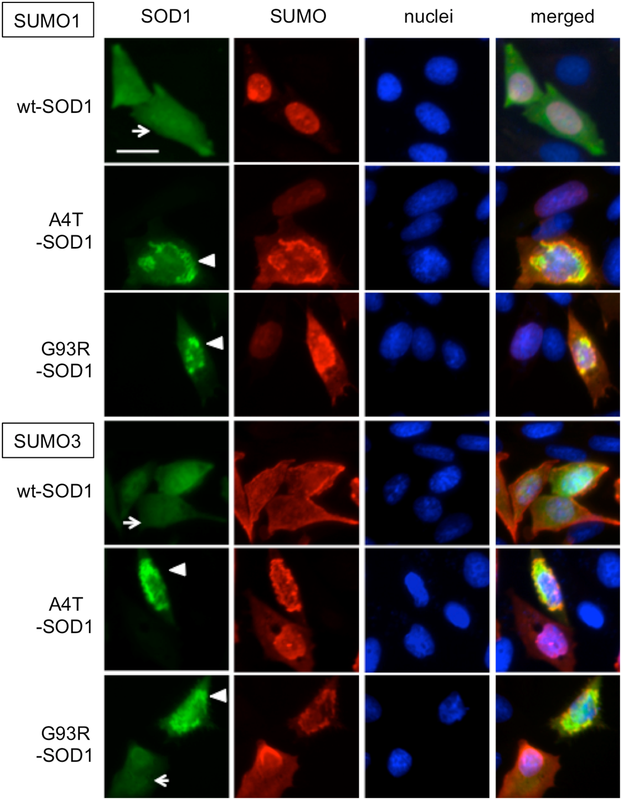 SUMO3 Modification Accelerates the Aggregation of ALS-Linked SOD1 Mutants. PLOS ONE 9(6): e101080. doi: 10.1371/journal.pone.0101080. Takano, M. et. al. (2012). MRI Characterization of Paranodal Junction Failure and Related Spinal Cord Changes in Mice. PLOS ONE 7(12): e52904. doi: 10.1371/journal.pone.0052904. Watakabe, A et. al. (2012). Visualization of Cortical Projection Neurons with Retrograde TET-Off Lentiviral Vector. PLOS ONE 7(10): e46157. doi: 10.1371/journal.pone.0046157. Job Opportunities: Handshake of Businessman and Businesswoman by Tamagoshi via Crestock.com. Meetings: La Canée, Crete, Greece by Picsfromsomewhere . Released under a Creative Commons NonCommercial ShareAlike 2.0 Generic License CC BY 2.0 via Flickr.com. About ALS: eBook Reader Concept by LucaDP via Crestock.com. ALS non-profits: A group of people with hands joined by DG EMPL. Released under a Creative Commons NonCommercial ShareAlike 2.0 Generic License CC BY 2.0 via Flickr.com. ALS Research Initiatives: Group of laboratory technicians examining data by Ryan McVay via Gettyimages.com.